Flying Cutoff Saws from Creative Automation are Custom Built for Wood and Related Industries – Creative Automation, Inc.
Creative Automation flying cutoff saws cut material at desired locations and lengths without the material stopping. 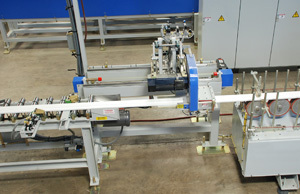 Flying cutoff saws are utilized in production scenarios where speed, accuracy and flexibility are critical to production success. 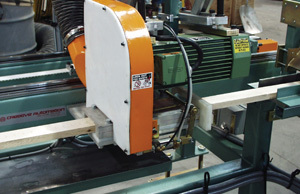 This flying cutoff saw was integrated into a moulder/profile wrapper line. Flying cutoff saw and cross transfer. 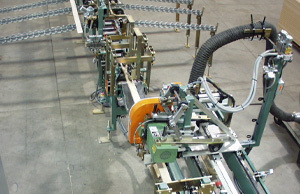 This system is part of a fingerjointing line. The saw cuts at desired locations and lengths based on operator- entered criteria. Closeup of the flying cutoff saw.